Our walk last weekend through, well, most of Boston, ended up taking us right down Hanover street through the very center of Boston’s North End (their Little Italy), and right past the epicenter of activity on a warm weekend evening: Mike’s Pastry. Okay, I’ll be honest, Mike’s Pastry is anything but offbeat. 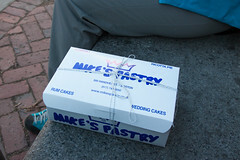 In fact, it’s almost guaranteed that if I mention that I’m going to Boston to eat, someone in the group will insist on my going to Mike’s Pastry. So, just like all the little offbeat places I review, occasionally I have to review the iconic ones as well. So on a fairly pleasant spring evening, we found ourselves waiting on the sidewalk, and then sharpening our elbows and working our way into the semi-anarchic interior of Mikes for some cannoli. I think the ritual is part of what people like about Mike’s. If you can look past the crowds of people, it’s really a pleasant shop, with stamped tin everywhere… but unless you go doing the slowest off-hours, you’ll barely see it. 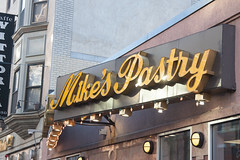 Instead, most of your view of Mike’s will be of the sidewalk outside, the large “Mike’s Pastry” sign, and then of the back of the people in front of you all trying to suss out which is the shortest line (with many egregious examples of line cutting in the process). Until you get to the very front of the line, all you can really see is a series of photos along the top of the wall showing the many (around 20) varieties of cannoli, so that by the time you get to the front of the line, you better know what you want before the person behind you knifes you. But when you get to the front, you are greeted by a surprisingly friendly (at least by Boston standards) clerk who will take your order, efficiently line it up on the counter for your inspection, and then deftly package it up in the classic blue and white box tied with string (that you see people toting all around the city). The crowd will then push in around you and quickly convect you back to the street, where you can find a semi-quiet spot to go eat some of your plunder (Paul Revere Park down the way is usually pretty good for this if there aren’t too many Colonial re-enactors hanging about). 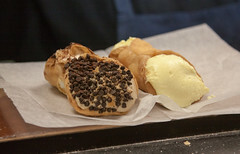 It’s a bit of drama, and it’s worth asking why people wait through such an experience when there are a handful of other great-looking and well respected cannoli places within a stone’s throw (such as the also highly-regarded Modern Pastry just across the street). I can’t answer that, since I’ve actually only been to Mike’s (so far, I’ll do Modern in a few weeks), but what I can say is that Mike’s definitely has earned their reputation as a must-visit joint for people new to Boston, since the cannoli are really quite good. The fillings are rich and flavorful with a nice creamy but dense texture that you expect from a good ricotta. I find it slightly sweet for my palate, but it’s definitely not overly sweet. 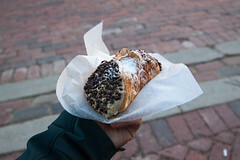 Combine that with a rather larger-than-normal and perfectly crisped cannoli shell, some nuts/sprinkles/chocolate chips for the ends, and an ample dose of powder sugar applied to the whole assembly, and it’s one of the better exemplars out there for what cannoli should be like. There’s definitely some substance here, and between the waiting, the mild rudeness of other customers, the tradition (I first had a cannoli from Mike’s in the 70s, and it was damn near identical) and the actual cannoli variety and quality, there’s something to be said for Mike’s. There’s a reason there’s a line. Also try a cookie next time (my go-to is the chocolate dipped peanut butter). Thick, with just the right amounts of crispness and chew.